I was at the seaside when a reporter from Vice magazine asked me whether I had any photographs of the village of Carcaliu. I had visited the place for the first time in 2010, stopping off at the Lipovian church, but I hadn’t taken any photographs, even though I had gone there as part of a documentary I was doing on religious belief in Romania. That was just the way things had turned out. The beauty of the place enchanted me from the very beginning. Lying in the foothills of the Macin Mountains, a stone’s throw from the Danube, the old settlement is a delight to behold, thanks to the landscapes and the richness with which it has been blessed. All the same, despite what I could see, everyday life for the locals was hard. 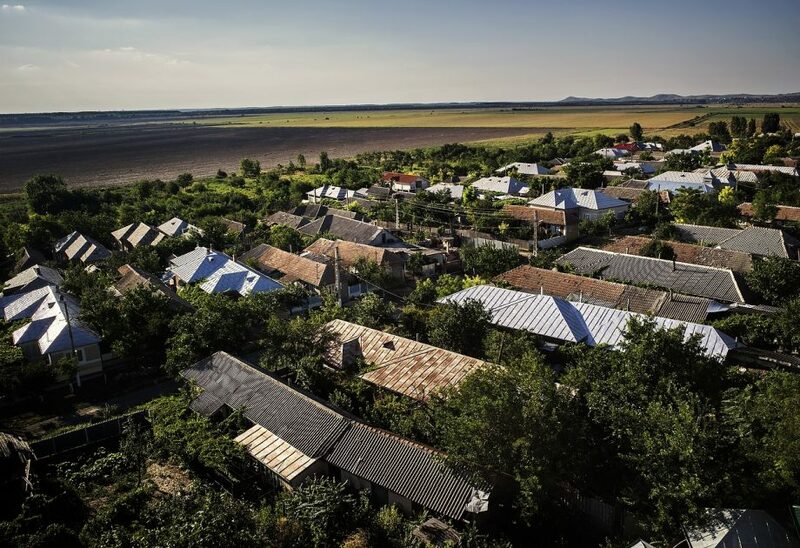 The lack of any prospects had led many young people to go abroad in search of work, and this exodus left behind it a village plunged into silence. The atmosphere livened up only during the summer holidays. Given this situation, nobody could ever have foretold that the most unlikely of events would put this formerly sleepy village on the world map, an event in which the locals were both witnesses and central characters: the notorious theft of artworks from a gallery in Holland. After talking to the journalist from Vice, I decided to go back there. And so, on 1 August, at around seven o’clock in the morning, I arrived in Carcaliu for the second time. I was to document the case of the paintings stolen by Radu Dogaru, who was born in the village and whose family still lives there. But Carcaliu is famous not because of this detail in the story, but because it was here that the seven canvases by famous artists including Picasso, Monet and Matisse, and valued at around twenty million dollars, are supposed to have been hidden and finally burned. My plan was to meet a former mayor in Macin, who would introduce me to a guide from the area, but when I telephoned him en route he didn’t answer. Fearing that I wouldn’t be able to get hold of him, I went straight to Carcaliu, trying to find my way around unaided. This was quite a difficult task, given that my information about the robbery was scanty. At the edge of the village I stopped to ask a local directions to the Romanian cemetery. I had heard that the priceless masterpieces had at one point been buried in the graveyard for a few hours and that the ash of the burnt canvases was supposed later to have been dumped in a rubbish tip there. I parked my car in front of the first house I came to and then entered the cemetery. It was not until an hour later that I discovered I had parked in front of the house of none other than the Dogaru family. From the cemetery I went to the rubbish dump. In the immediate vicinity I met two women who were gathering weeds, which they use to make brooms. It was thus I met Zamfira Croitoru, a neighbour of the Dogaru family, and it was she who informed me that I had parked in front of the gate of the very people I was looking for. From the area where I found myself, the village looked as though it lay on a promontory. The spectacular landscape, as well as the unconstraint with which Zamfira provided me with my first information, awoke a pleasant feeling in me from the outset. I walked back to the house of the Dogaru family and knocked on the gate. A young boy who was passing on a bicycle saw me and entered the yard to shout for somebody to come. It was then that I met Lavinia for the first time. Underestimated by many if not all of the journalists who had turned up in the village, she astonished me from the very first with her sparkling intelligence. A good friend of Olga Dolgaru, the mother of the man who had stolen the paintings and she herself also under arrest, Lavinia was now looking after the interests of the Dogaru family and dealt with all those who tried to contact them for whatever reason. Even if she had had to hire somebody to do the job, I doubt if Olga could have found a person more suitable than Lavinia. As a result of this friendship, many nullities in the Romanian press have had to deal with the formidable Lavinia. She listened to me carefully, knowing beforehand what it was I was after, and finally she politely invited me to be on my way. I thanked her and determined to follow the leads of the story I set off for the house of Olga’s sister, Mrs Marfa (Marusia) Marcu. It was still early when I reached her house. Very quickly, she was kind enough to invite me inside the house. This was the house that had been searched and where Radu had had his photograph taken with his girlfriend Natasha and the stolen paintings. I spent the next few hours photographing her as she cooked for her granddaughters, who had just come back for the holidays. As the girls were having a nap before lunch, I left, promising to come back that afternoon to hear her story and to take a few photographs inside. From there I went back to Mrs Zamfira’s. I spent the next two hours having lunch and listening to her life story. A strong woman, whose strength had been sorely put to the test, abused by her alcoholic husband, the mother of two children, she had been brave enough to leave home and build herself another house. The balaclava-wearing forces of law and order had burst into Zamfira’s house on the grounds that Radu Dogaru had once lived there. The organised crime squad had made use of the same flimsy excuse to search the houses of other innocent villagers. After listening to her wonderful stories and songs, I went back to Marusia’s. This time, we went into her dining room, where Dogaru had had his photograph taken, so that I could look at the traces left by the search and so that she could tell me about what happened during the arrest and investigation. In this way I discovered that the Romanian criminal justice system likes to play ‘good cop/bad cop’, or rather ‘good prosecutor/bad prosecutor’: the bad prosecutor swears and demeans, he moans about having been put to work by the supposed thieves, while the good prosecutor looks on impassively. Late that afternoon I left the village. I was waiting for a telephone call from Radu Dogaru’s brother in connection with permission to visit the house at whose gate I had parked early that morning. Late that night Cosmin telephoned Lavinia and she then told me that he did not want to give his permission, at least not for the moment. I was still not clear as to what I wanted to do. I told myself that was that and decided to go back to the seaside. The next day, at eleven o’clock, while I was bathing in the sea, I suddenly got an idea. I decided to return to Carcaliu. I spent what was left of the day documenting the surrounding area. At one point I also received permission to photograph the house where some of the paintings had been stored and supposedly burned. On the third day, I was allowed to shoot a few photographs of Radu’s grandmother. It wasn’t easy to gain permission, however, and for the first time I witnessed how, if I can put it like this, my reputation as an honest man opened doors for me. A wonderful feeling. From Radu’s eighty-six-year-old grandmother, Domnica Ivanov, I learned a number of interesting things. Her room is like a shrine, one side dedicated to God and the other to her family. First of all she told me about how Lipovian women choose their place in church: the first time they enter the church they choose a seat either on the left or on the right and they keep that seat for life. Then she told me about the importance of the girdle of the Mother of God, which, at the moment of death, is, for the Lipovians, like the candle for Orthodox of the new rite. All the villagers I met while working on this photo-reportage were hasty to judge the Dogaru family, although their crime against the village is far smaller than the wrong the villagers themselves committed when they voted back in the same communists who have been plundering us for more than seventy years and who we can’t get rid of. In their turn, the whole Romanian and international press portrayed them as ignorant peasants who had no idea about the worth of what they had stolen. The Venetian mask that has pride of place in Radu’s dining room and a souvenir mug with a reproduction of a famous painting, which I saw on Marusia’s stove when I visited her, told me a completely different story. Perhaps they didn’t know what to do with the stolen paintings, but they were certainly not ignorant of Art. General view of Carcaliu, as seen from the top of the Russian church on August 1, 2013. Radu Dogaru, has admitted to stealing famous artworks from the Kunsthal museum in Rotterdam last year. Romanian officials say Mr. Dogaru sent the stolen paintings, by Picasso, Monet and other modern masters, to Romania through an accomplice. 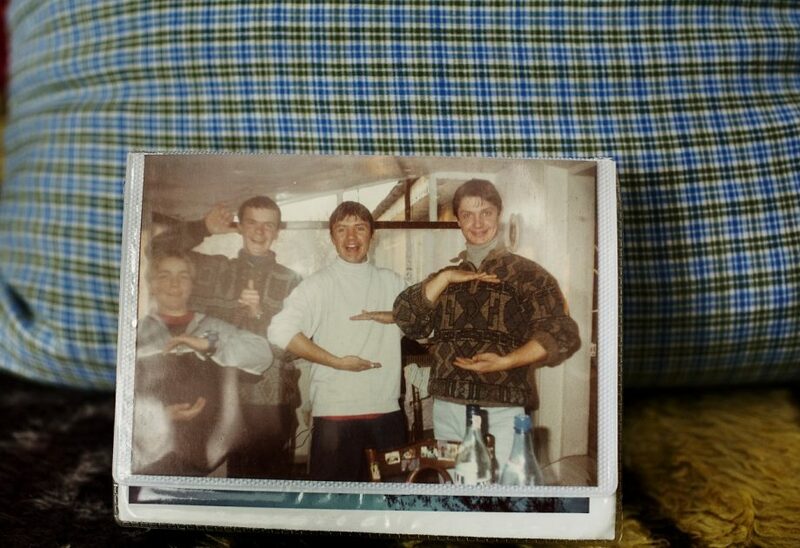 Old picture depicting Radu Dogaru as a teenager (white blouse in the middle) as seen in Carcaliu on August 3, 2013. Radu Dogaru, has admitted to stealing famous artworks from the Kunsthal museum in Rotterdam last year. Romanian officials say Mr. Dogaru sent the stolen paintings, by Picasso, Monet and other modern masters, to Romania through an accomplice. 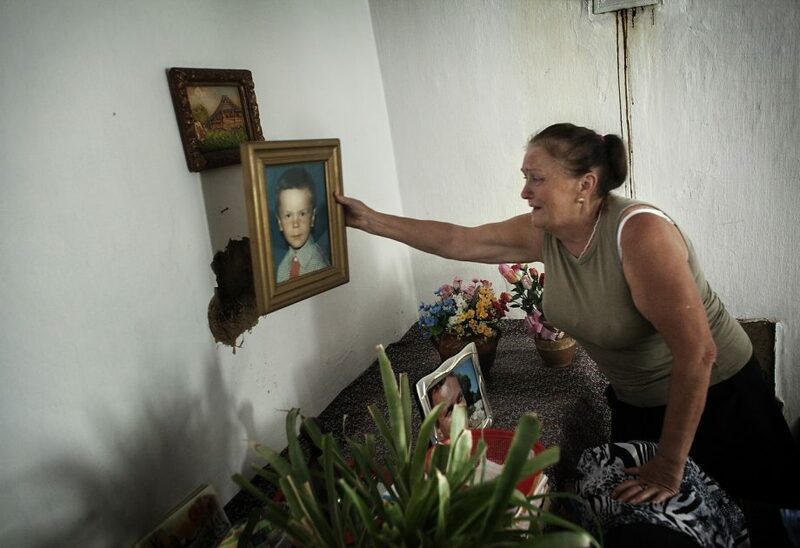 Marcu Marfa takes down the picture of her late son, killed in Italy, in a tragic work accident, to reveal the holes in the wall, traces of the search conducted by a Romanian anti-organised crime unit. Radu Dogaru, has admitted to stealing famous artworks from the Kunsthal museum in Rotterdam last year. Romanian officials say Mr. Dogaru sent the stolen paintings, by Picasso, Monet and other modern masters, to Romania through an accomplice.